QBO installations include a robust queuing infrastructure that wraps and extends existing industry-standing queuing technologies such as SQL Service Broker, AWS Simple Queue Service, Azure’s Storage Queues, or RabbitMQ. When we designed QBO, using some sort of message queuing to enable a scale-out architecture was an obvious requirement. We had no desire to invent our own messaging infrastructure – there are plenty of proven products to leverage. Today, we use several of them simultaneously, depending on the use cases. There are several places in the QBO3 UI that allow a power user to configure operations to be called, including whether to queue them and what queue to route the operation to. For example, when designing workflows, the power user is prompted to pick a queue from a drop down menu. Whenever the workflow executes the step, it will simply be queued into the appropriate queue for execution. The web server will write an Attachment/Generate message to a queue, and shortly thereafter (typically a few milliseconds), the Queue Service will pop this message, and call QBO’s Attachment/Generate method. The Queue Service can pop and process any QBO operation, including any database manipulation, application function (like generating documents), and calls to third party web services and APIs. Once an operation is configured in QBO, the queuing infrastructure can then be used to scale-out the execution of the operation in parallel across many application servers. Queues can be configured to be ignored by the Queue Service, so messages pushed to the queue may be popped by a third party consumer. This allows QBO to offer a publisher-subscriber model, ideal for exchanging data between QBO and third party systems in a robust, asynchronous manner. A limitation we encountered with ‘off the shelf’ message queuing was a lack of future queuing. It’s often useful to queue operations for execution 15 minutes from now, on the first of the month, daily at 6 am, or such. When QBO queues an operation, if there is a QueueDate specified by the operation, QBO will push the operation to a dedicated “future queue”. The future queue is a special queue, managed by the Queue Service. When the queue date passes, the Queue Service will pop the message and push it to a “normal” queue (Azure, SQS, Service Broker) for processing. The ability to future queue operations is a powerful layer on top of any of the ‘off the shelf’ message queuing configured to run with QBO. Schedules can be complex, including the definition of business days, hours of operation, and holidays. A single job can be associated with a schedule, as well as an entire queue. QBO is typically used to orchestrate communications between a variety of third party systems, and any system is likely to have hiccups once in a while. FTP sites get busy and refuse connections, VPN tunnels go down for a few seconds, and web APIs occasionally are taken offline for maintenance. QBO’s Queuing infrastructure is designed to handle these types of errors without requiring human intervention. Error handling options for a queue. When a given queue encounters enough consecutive errors, the queue will pause itself, and notify power users (or Quandis engineers). 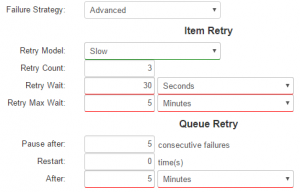 Queues may be configured to automatically restart themselves after a period of time, which Quandis has found very useful for third party APIs that occasionally go offline for unplanned maintenance. All of these options have been pre-configured and are available from a simple drop down list. Advanced power users are welcome to control each of the data points considered by the Queuing error strategy, tailoring it to their nuanced requirements. Once every year or so, Quandis is asked to integrate with a third party system that either has terms of service that limit the rate at which it can be called, or that is limited in it’s ability to handle concurrency. In these cases, a queue can be configured to limit the number of operations allowed per second (or ms, minute, hour, day, month, year, etc.). This allows QBO to queue as many operations as quickly as users want, using a queue to ‘buffer’ the requests to the third party. For example, some websites can only handle a few dozen users at once, so a screen scraping queue may be configured to throttle screen scrape operations to 1 every 3 seconds. Queuing typically operates on a First-In-First-Out (FIFO) basis. This works well for most use cases (and in fact is required for many use cases). Occasionally, however, FIFO can be problematic. Queuing implements the concept of prioritization by enabling queues to be dependent on other queues. The Queue Service will not pop messages from the queue unless all queues that it is dependent upon are empty. we want this payment to “jump” ahead of the 100,000 queued at 6am – this is high priority! In real world conditions, we’ve seen our OCR queue trigger adding 100 additional servers to OCR nearly a million documents in about two hours, then revert to the typical 2 servers monitoring our typical load. Auto-scaling allows you to guarantee a certain throughput for specific operations, regardless of load. It also minimizes cost, allowing you to plan for “normal” loads yet knowing you can still meet Service Level Agreements should a surge in demand strike. If a power user can configure an operation in QBO, it can easily be queued and auto-scaled to meet virtually unlimited demand.